Some years ago, Eddie Rabbitt sang that he loved a rainy night. 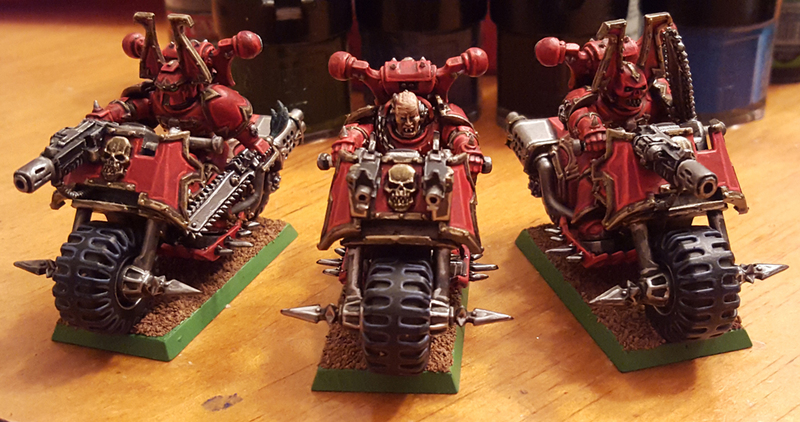 Well, I loved having a rainy day on Friday as it meant things like yard work could not get done, leaving me with more time to finish my bikers. And that’s exactly what I did. I was able to finish nearly all the highlighting and paint the bases. And today I was able to glue on the ballast. I didn’t have as much time today, but I was fine with that because I was not expecting to be this far along. As such, I’ll be able to paint the ballast tomorrow and essentially be done. Yeah, yeah, I’ll still have to do the gemmed buttons and the console screen, but that’s minor. In fact, I was so pleased with my progress, I scheduled a game at the local GW store. First time I’ll be able to run my Khorne Daemonkin as a proper Bloodhost Detachment, and I’m looking forward to it! Seduced by the dark side… again!